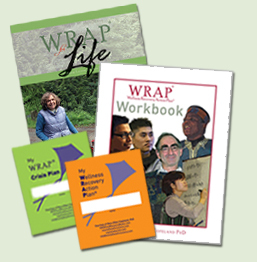 Our WRAP for Life Bundle includes the following popular WRAP materials: WRAP for Life, WRAP Workbook, My WRAP and My WRAP Crisis all for $28.00. If you bought the items individually they would cost $33.95, buy the bundle and SAVE! This book can serve as your day-to-day guide for working on personal issues like raising your self-esteem and self-confidence, developing a strong support system, enhancing your relationships with family members and friends, making new friends, learning to be more assertive, increasing your career or vocational competencies, and enriching your life. It is used to help address issues related to “whole” health. WRAP WORKS! Many people don’t like writing in a book, they prefer to keep them tidy for easy reference and for sharing with friends and supporters. People are also afraid that when they write in books, their writing would not be confidential. While many people have their WRAP in a loose-leaf binder or notebook, use the online course or the WRAP app, there are many people who have requested this book of forms. The key feature of this brochure is accessibility. By using this format, you can have your WRAP with you wherever and whenever you might need it. My WRAP Crisis Plan is a pocket-size way to keep your Crisis Plan in your purse, wallet or pocket. In the event of a crisis, it’s easy to share it with supporters and care providers.